We are delighted to launch our new e-resource for schools, packed with links to books, film clips and lesson ideas. 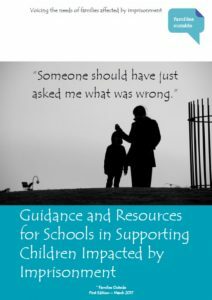 The resource raises awareness about the issues children face when a family member is imprisoned, providing tools and helpful guidance for supporting children in the school setting. To download the e-resource, please click on the image below.